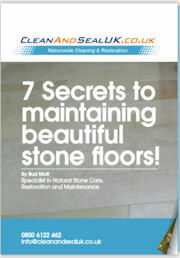 Experts in commercial Limestone floor cleaning Bristol. Commercial limestone floor cleaning Bristol and maintenance can be a task in itself. However, if your commercial limestone floor has not been sealed properly, or not sealed at all for that matter, then you’ve got yourself a problem! Limestone is very porous and will soak up virtually anything that is left on the surface of your floor and leave behind marks and stains. If you thought your commercial limestone floor tiles were going to be easy to maintain and has now become your biggest nightmare. Then make sure you contact the Clean and Seal Team to come and restore your commercial limestone floors back to their original beauty. There’s no point choosing such a beautiful floor for your commercial property if you’re not going to maintain it. Cleaning commercial limestone floors Bristol. With so many limestone floor types in commercial properties throughout the uk, means that cleaning commercial limestone floors Bristol and Bath is not a straightforward procedure. We’ve seen so many jobs where the cleaning contractor has applied the wrong limestone floor cleaning product and made a right mess of the limestone floor. If this is you and you need professional commercial limestone floor cleaners in Bristol, Bath and the whole of the Southwest of the UK then contact CleanAndSealUK. The limestone floor seemed clean, almost as if it hadn’t changed since it was first applied. However, once we had given it a good clean, the transformation was obvious! The floor that was once dull and plain was now sparkling and shiny, giving the whole room a really good, up-market feel to it. Do you think your commercial limestone floors could benefit in the same way? Whatever limestone feature you have in your property should be cleaned annually. 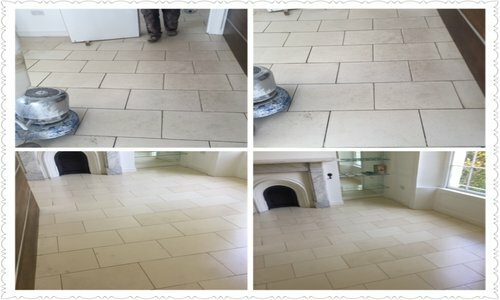 With the CleanandSealUK method of cleaning commercial limestone floors, cleaning limestone fireplaces or commercial limestone tiles cleaning Bristol. You can relax knowing our commercial limestone floor cleaning Bristol service with the correct limestone cleaning products is just the job for you! Sealing Commercial limestone Floors PROTECTS THEM. Let me enlighten you a little. Applying sealers or impregnator’s to commercial limestone flooring needs to be done properly, left to an amateur can have an adverse reaction and an appearance you weren’t expecting. CleanAndSealUK Seal commercial Limestone floors Bristol the correct way so you can have an amazing looking and protected limestone floor.